"It was only supposed to be a summer job"
Nintendo's joint position as the venerable grandfather of gaming and constant innovator is a combination of imagination, intelligence and experience, and the latter is something the company's guiding lights certainly are not short of. Nintendo's annual general meeting is coming up next week, and the company will be electing ten directors, a slight slimming down from its current 11 directors. Nintendo has put together a quick summary of the candidates, and their wealth of experience at the company is incredible. Between them, the directors have spent an enormous 285 years working at the company. The longest-serving director is General Manager of the Manufacturing Division Nobuo Nagai, who's been at Nintendo since March 1967, making Shigeru Miyamoto's joining date of 1977 look decidedly late to the party. Satoru Iwata, the youngest of the directors, is a novice by comparison, with just 11 years of service under his belt. With such experience at its top level, is it any wonder Nintendo is still the biggest name in gaming? Yeah, Iwata moved up rather quickly. That's a whole lot of experience there! Wow for a moment I thought the article meant that Nintendo has lasted for 285 years. Its actually about 122 years, Nintendo was founded in 1889. I wonder whatever happened to the Yamauichi family, wasn't it them who used to run Nintendo before Mr Iwata took over? @SoulSilver According to the proxy statement linked from here, Yamauchi is the largest shareholder of Nintendo holding 11% of Nintendo. It is probable that some of the directors were nominated on his behalf, whether according to agreements between parties, or because of his power. Either way, he can exert some significant influence. Hiroshi Yamauchi retired to be the Chairman of the Board of Directors in 2002, leaving Iwata as his successor of choice. He retired from that position about 3 years later. He still remains the largest shareholder of Nintendo, though. That's a lot of time and bits:-D Iwata may have moved up so quickly for being such an innovator and Nintendo knowing when let someone else take a chance depending on vision. Wow, these people sure know what they're doing! For a few seconds, I thought the dob's were the join dates. Before he became a director at Nintendo, Iwata was at HAL Laboratory so he still has plenty of relevant experience! Throughout the history since agriculture, Japanese have valued their co-workers like family. Of course with capitalism and population growth in the more recent generations have changed the values, but one's company is still a huge deal. Every Japanese company has individual policies of for example how to address a superior, how to be clothed, how many thank yous is enough and how many steps you take from the door before making eye contact... And it's a huge deal, of course. 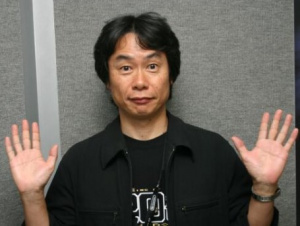 No matter what, I will still love Miyamoto. He created my childhood =P...and some of my mom's adult-hood...no he created my whole familiy's child-hood! So by going from 11 to 10, someone will be axed? Funny if it were Miyamoto or Iwata (won't happen). Iwata was originally associated w/ Hal labs. He was a programmer for Kirby's Adventure, I think. Iwata is a pretty cool guy. eh reads encyclopedias and doesn't afraid of anything.